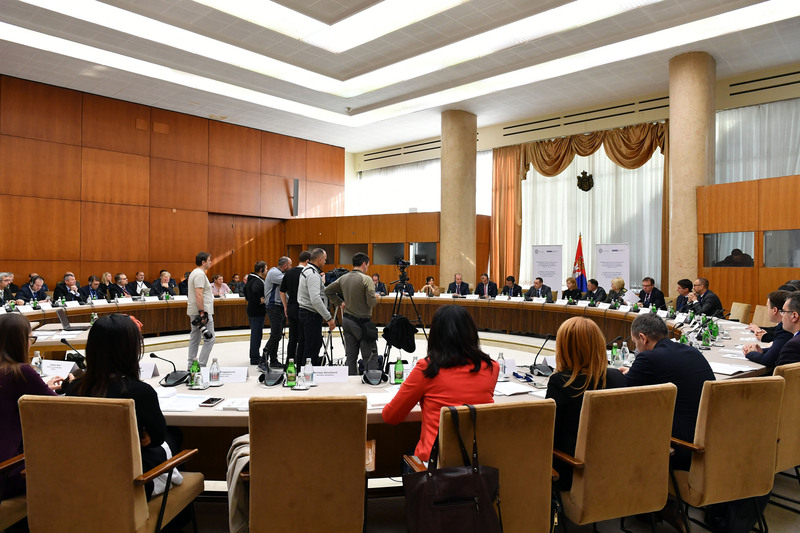 Ministry of Defence of the Republic of Serbia, with the support of OSCE Mission to Serbia, has organized an international Conference on the Development of a System for Seconding Civilian to International Missions of the OSCE, EU and UN. The conference took place in Belgrade, from 7th to 8th of November 2017 and it welcomed foreign and domestic experts from both governmental and nongovernmental sector. The conference was organized on a high level and was attended and opened by Mr. Aleksandar Vulin, Minister of Defence, Ms. Ksenija Milenkovic, Acting Assistant Minister at the Ministry of European Integration, Mr. Sem Fabrizi, Ambassador and the Head of the Delegation of the EU to the Republic of Serbia and Mr. Andrea Orizio, Ambassador and the Head of the OSCE Mission in Serbia. During his opening remarks, Minister of Defence underlined the importance of this topic and emphasized that it is high time for Serbia to take a step forward, and start participating in civilian missions as well. He added that Serbia should not do this only because that is part of its obligation steaming from Chapter 31, but because it is good and useful tool for the Republic of Serbia to extend its influence. The conference builds on the ongoing process of Development of Serbia’s National Capabilities for Civilian Contributions to Peace Support Operation that started in 2016 with the support of the Czech Development Agency and is led by the Ministry of Foreign Affairs, Ministry of Defence and Ministry of European Integration in cooperation with ISAC Fund. It is of great significance that the OSCE has recognized the progress that has been made in this area and that they have decide to contribute to its further development. Mr. Nikola Petrović, director of the ISAC Fund, also spoke on the conference. He gave a brief presentation about the project Development of Serbia’s National Capabilities for Civilian Contributions to Peace Support Operation, presented the role of the ISAC Fund in the process of building a system for sending civilians to multinational peacekeeping operations, reflected on the achieved results and discussed the forthcoming challenges.